Philadelphia car accident attorney talks about why you need a lawyer, not just your insurance company, to handle your car accident claim. Car accident attorney, Rand Spear, wants Philly car accident victims to understand their rights when they have been in an auto wreck. Many people don’t know that it’s important to have an experienced car accident lawyer to represent them and advocate for them when they have been in a car accident, and that they don’t have to settle for what the insurance company offers. Insurance companies are looking out for their own interests – not yours. When you have been in an auto accident, the insurance companies will try to settle with you for the smallest amount of compensation they can. Even very reputable insurers will look to make the best deal they can – for their company. An attorney will fight for what you truly deserve for your claim. You are probably entitled to more compensation. 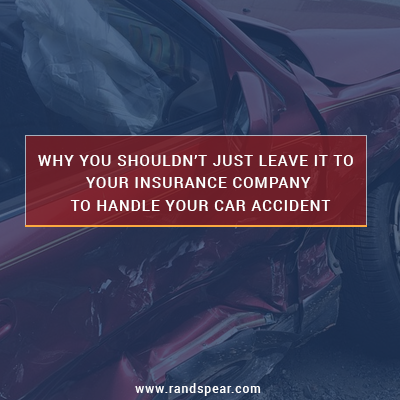 The expenses that are incurred when you are in a car accident can be extensive – both medical bills and property damage or replacement expenses. You will likely be able to recover more for your damages when you are represented by a car accident lawyer. You may not know the extent of your injuries right away. Injuries that are sustained in car accidents can take weeks or months to present themselves, yet insurers will attempt to settle your claim quickly, sometimes before you are recovered from your injuries, making it impossible to collect compensation for your ongoing medical bills. When you have an attorney, he can help you negotiate the timing of your claim to ensure that all of your medical issues are addressed. If you or a loved one has been in a car accident in Pennsylvania, it’s important that you contact an experienced car accident lawyer to help you with your case and to make sure that you are not taken advantage of by insurance companies. Contact attorney Rand Spear at 877-GET-RAND to get the right attorney in your corner.